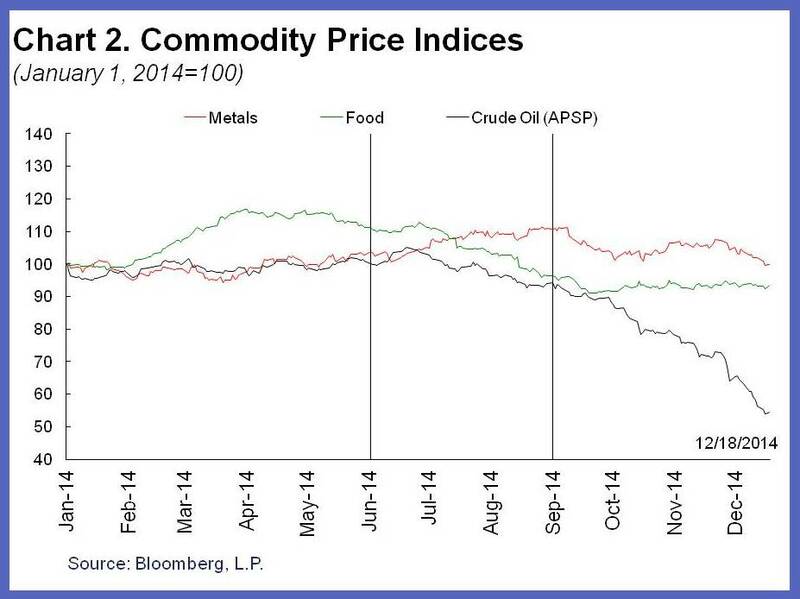 Oil prices have plunged recently, affecting everyone: producers, exporters, governments, and consumers. Overall, we see this as a shot in the arm for the global economy. Bearing in mind that our simulations do not represent a forecast of the state of the global economy, we find a gain for world GDP between 0.3 and 0.7 percent in 2015, compared to a scenario without the drop in oil prices. There is however much more to this complex and evolving story. In this blog we examine the mechanics of the oil market now and in the future, the implications for various groups of countries as well as for financial stability, and how policymakers should address the impact on their economies. We find both supply and demand factors have played a role in the sharp price decline since June. Futures markets suggest that oil prices will rebound but remain below the level of recent years. There is however substantial uncertainty about the evolution of supply and demand factors as the story unfolds. While no two countries will experience the drop in the same way, they share some common traits: oil importers among advanced economies, and even more so emerging markets, stand to benefit from higher household income, lower input costs, and improved external positions. Oil exporters will take in less revenue, and their budgets and external balances will be under pressure. Risks to financial stability have increased, but remain limited. Currency pressures have so far been limited to a handful of oil exporting countries such as Russia, Nigeria, and Venezuela. Given global financial linkages, these developments demand increased vigilance all around. Oil exporters will want to smooth out the adjustment by not curtailing fiscal spending abruptly. For those without savings funds and strong fiscal rules, budgetary and exchange rate pressures may, however, be significant. Without the right monetary policies, this could lead to higher inflation and further depreciation. The fall in oil prices provides an opportunity for many countries to decrease energy subsidies and use the savings toward more targeted transfers, and for some to increase energy taxes and lower other taxes. In the euro area and Japan, where demand is weak and conventional monetary policy has done most of what it can, central banks forward guidance is crucial to anchor medium term inflation expectations in the face of falling oil prices. Again, our simulations of the impact of the oil price drop do not represent a forecast for the state of the world economy in 2015 and beyond. This we will do in the IMF’s nextWorld Economic Outlook in January, where we will also look at many other cross-currents driving growth, inflation, global imbalances and financial stability. What are the respective roles of demand and supply factors? How persistent is this supply shift likely to be? What are the effects likely to be on the global economy? What are likely to be the effects on oil importers? What are likely to be the effects on oil exporters? What should be the policy response of oil importers and exporters? Oil prices have fallen by nearly 50 percent since June, 40 percent since September (see Chart 1). Metal prices, which typically react to global activity even more than oil prices, have also decreased but substantially less so than oil (see Chart 2). This casual observation suggests that factors specific to the oil market, especially supply ones, could have played an important role in explaining the drop in oil prices. A closer look reinforces this conclusion. Revisions between June and December of International Energy Agency forecasts of demand (see Chart 3), combinedwith estimates of the short run elasticity of oil supply, suggest that unexpected lower demand between then and now can account for only 20 to 35 percent of the price decline. On the supply side, the evidence points to a number of factors, including surprise increases in oil production. This is in part due to faster than expected recovery of Libyan oil production in September and unaffected Iraq production, despite unrest. A major factor, however, is surely the publicly announced intention of Saudi Arabia—the biggest oil producer within OPEC—not to counter the steadily increasing supply of oil from both other OPEC and non-OPEC producers, and the subsequent November decision by OPEC to maintain their collective production ceiling of 30 million barrels a day in spite of a perceived glut. The steady increase in global oil production could be seen as “the dog that didn’t bark.” In other words, oil prices had stayed relatively high in spite of the upward trajectory in global oil production due to the perception at the time of OPEC’s induced floor price. The resulting shift by the swing producer however helped trigger a fundamental change in expectations about the future path of global oil supply, in turn explaining both the timing and magnitude of the fall in oil prices, bringing the latter closer to the level of a competitive market equilibrium. A similarly dramatic drop took place in 1986, when Saudi Arabia voluntarily stopped being the swing producer, causing oil prices to fall from $27 to $14 per barrel, only to recover fifteen years later, in 2000. Beyond traditional demand and supply factors, some have pointed to “financialization”—oil and other commodities considered by financial investors as a distinct asset class—and “speculation” as contributors to the price decline. We see little evidence that this is the case. According to the latest report from the International Energy Agency, oil inventories have reached their highest level in two years, suggesting expectations of price increases, not price declines. The first is whether OPEC, and in particular Saudi Arabia, will be willing to cut production in the future. This in turn depends in part on the motives behind its change in strategy, and the relative importance of geopolitical and economic factors in that decision. One hypothesis is that Saudi Arabia has found it too costly, in the face of steady increases in non-OPEC supply, to be the swing producer and maintain a high price. If so, and unless the pain of lower revenues leads other OPEC producers and Russia to agree to share cuts more widely in the future, the shift in strategy is unlikely to change soon. Another hypothesis is that it may be an attempt by OPEC to reduce profits, investment, and eventually supply by non-OPEC suppliers, some of whom face much higher costs of extraction than the main OPEC producers (see Chart 4, which gives the world marginal cost curve, showing how much it costs to produce an additional barrel by type of oil extraction). The second factor is how investment and in turn oil production will respond to low oil prices. There is some evidence that capital expenditure on oil production has started to fall. According to Rystad Energy, overall capital expenditure of major oil companies is 7 percent lower for the third quarter of 2014 compared to 2013. Available projections from the same source indicate that capital expenditures will fall markedly throughout 2017. 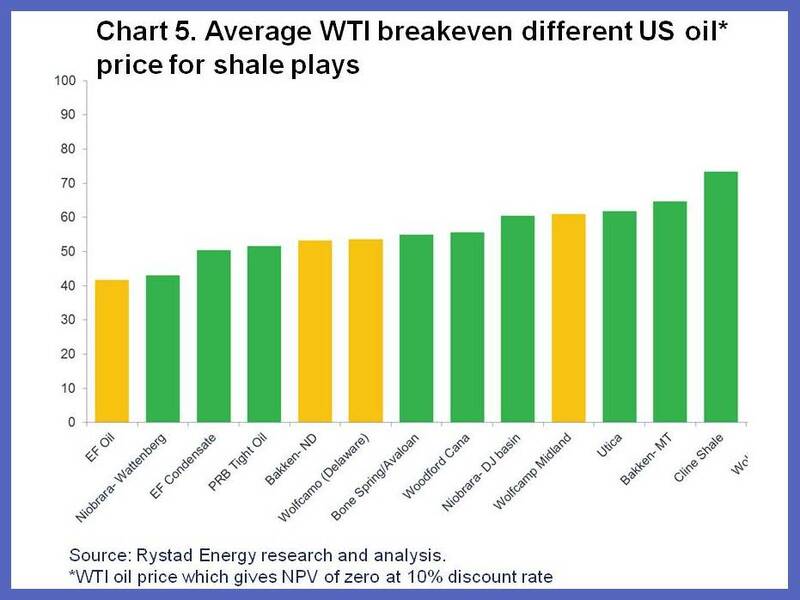 For unconventional oil, such as shale, (which now accounts for 4 million out of a world supply of 93 million barrels a day), the break-even prices—the oil price at which it becomes worthwhile to extract—of the main United States shale fields (Bakken, Eagle Ford and Permian) are typically below $60 per barrel (see Chart 5 which gives break-even prices for the United States shale fields). 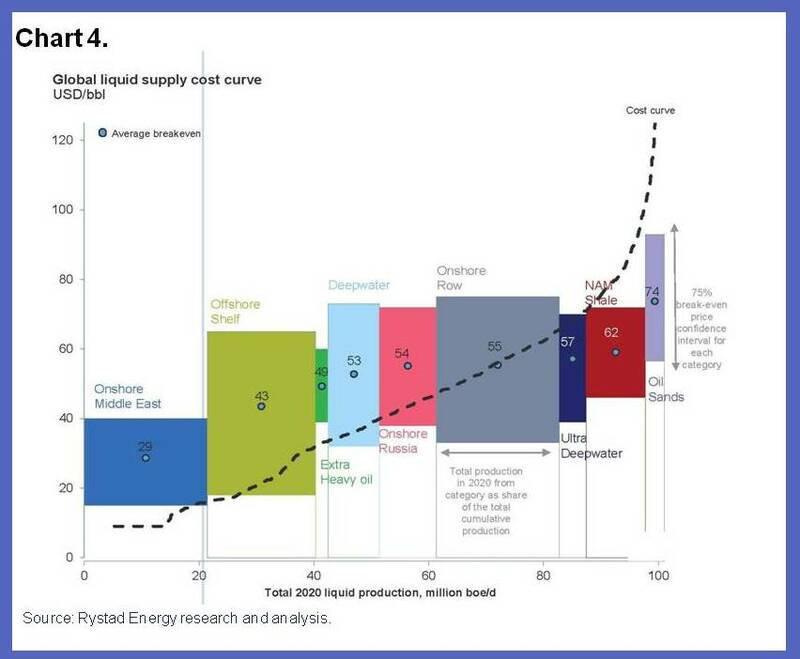 At current prices (around $55 per barrel), Rystad Energy’s projections suggest that the level of oil production could decline but only moderately by about less than 4 percent in 2015. Rates of return will be significantly lower, however, and some highly leveraged firms that did not hedge against lower prices are already under financial stress and have been cutting their capital expenditure and laying off significantly. Thus, other things being equal, the dynamic effects of low prices on supply should lead to a decrease in supply relative to the initial shift and thus to a partial recovery of prices. This is what is suggested by futures markets, which show, in the left hand side panel of Chart 6, an expected recovery of prices to $73 a barrel by 2019. The uncertainty associated with these forecasts comes not only from supply but also demand factors. On the supply side, for example, possible changes in OPEC’s strategy and geopolitical tensions in Libya, Iraq, Ukraine, and Russia should not be underestimated. On the demand side, uncertainty about global economic activity and thus the derived demand for oil remains high. This is shown, emphatically, by the size of the implied distribution of futures prices (based on options prices) in the right hand side panel of Chart 6: the 68% confidence band for the price in 2019 ranges from $48 to $85, the 95 percent band from $38 to $115; a very wide range indeed. Overall, lower oil prices due to supply shifts are good news for the global economy, obviously with major distribution effects between oil importers and oil exporters. The crucial assumptions in quantifying the effects of those supply shifts are how large and persistent we expect them to be. These assumptions determine not only the path of adjustment, but also the initial reaction of consumers and firms. Given the uncertainty about the relative importance of supply shifts, both now and expected in the future, we present the results of two simulations (these are ceteris paribus in nature—not projections about the global economy, and as such ignoring all other shocks likely to affect the global economy), which we see as representing a reasonable range of assumptions. The first assumes that the supply shift accounts for 60 percent of the price decline reflected in futures markets. The second also assumes that the supply shift accounts for 60 percent of the price decline at the start but that the shift is partly undone over time for the reasons described above, with its contribution to the price decline going gradually to zero in 2019. The results of the simulations shown below capture only the effects of the supply component of the oil price decline (the demand driven component of the oil price decline is a symptom of slowing global economic activity rather than a cause). The oil price projection used in the simulations is based on the IMF’s price forecast, which is itself based on futures contracts. The results for global GDP are shown in Chart 7. The first simulation implies an increase in global output of 0.7 percent in 2015 and 0.8 percent in 2016 relative to the baseline (the situation without the oil price drop. Not surprisingly, in the second scenario, the effect on output is smaller, of the order of 0.3 percent in 2015 and 0.4 percent in 2016. The range of these effects includes predictions which would be obtained using existing empirical estimates for advanced economies. Estimates from Blanchard and Gali (2009) for example find that the effect of a permanent (supply driven) decrease in the price of oil by 10 percent leads to an increase in U.S. output by about 0.2 percent. Given a supply component of the price decline of about 25% (60% of a total decline of 40%), these estimates would therefore imply an increase in output of about 0.5%. These global results mask asymmetric effects from lower prices across countries. Winners are the (net) oil importing countries, losers are (net) oil exporting countries. But, even within each group, there are important differences. There are three main channels through which a decrease in the price of oil affects oil importers. The first is the effect of the increase in real income on consumption. The second is the decrease in the cost of production of final goods, and in turn on profit and investment. The third is the effect on the rate of inflation, both headline and core. For example, the real income effect is smaller for the United States, which now produces over half of the oil it consumes, than for the euro zone or for Japan. The real income and profit effects also depend on the energy intensity of the country: China and India remain substantially more energy intensive than advanced economies, and thus benefit more from lower energy prices. The share of oil consumption in GDP is on average 3.8 percent for the United States, compared to 5.4 percent for China and 7.5 percent for India and Indonesia. The effect on core inflation depends both on the direct effect of lower oil prices on headline inflation, and on the passthrough of oil prices to wages and other prices. The strength of the passthrough depends on real wage rigidities—the way nominal wages respond to CPI inflation—and the anchoring of inflation expectations. In normal times, monetary policy would respond to lower core inflation through a more than one-for-one decrease in the nominal interest rate, and thus a lower real interest rate. However, times are not normal, and the major advanced economies are constrained by interest rates at zero, leaving aside quantitative easing. While the United States, which is getting closer to exiting this zero lower bound, can respond to a decrease in inflation by delaying the timing of its exit, the euro zone and Japan, which are expected to remain at the zero lower bound for a long time, cannot materially change their conventional monetary policy. Our simulations reflect, to the best possible extent, these differences in energy intensity, in the proportion of oil produced at home, and in monetary policy constraints. We assume that inflation expectations are similarly anchored in the United States, the euro zone, and Japan, leading to a pass through of about 0.2, so a decrease in core inflation of 0.2 percentage points when headline inflation decreases by 1 percentage point. The implications for GDP are shown in Chart 8 for the two simulations described earlier. The effect on China in both scenarios are larger than those for Japan, the United States and euro zone countries. For China, GDP increases 0.4-0.7 percent above the baseline in 2015, and 0.5-0.9 percent in 2016. For the United States, GDP increases 0.2-0.5 percent above the baseline in 2015, by 0.3-0.6 percent in 2016. (The simulation assumptions do not take into account the potential offset from some policies that governments may implement following the fall in oil prices. For example, China may decide to tighten monetary or fiscal policy in response to the oil price decline). The depreciation of the yen and the euro since June (by 14 percent and 8 percent respectively, for reasons mostly unrelated to the decline in the price of oil), imply that the decrease in the price of oil in terms of yen and euros has been smaller than in dollars, namely 36 percent and 40 percent respectively. Those depreciations somewhat mute the impact of the oil price slump for Japan and the euro zone compared to our simulations. In countries which have large specific—as opposed to proportional—taxes on energy (that is, they levy a fixed dollar or euro amount per gallon or liter), the same percentage decrease in the world price of oil leads to a smaller percentage decrease in the price paid by consumers and firms. Countries may also use the opportunity of a decreasing price of oil to reduce energy subsidies—a move that has been generally recommended by the IMF—leading again to a smaller decline in the price paid by consumers and firms. Some oil importers depend heavily on what happens to oil exporters, and thus may benefit less from lower oil prices. For example, low-income importers in the Caribbean that benefit from transfers under Venezuela’s Petrocaribe regime could face a marked reduction in transfers as Venezuela itself comes under pressure. Caucasus and central Asia oil importers are likely to experience adverse spillovers from slowing growth in their oil exporting neighbors, particularly Russia, which will reduce non-oil exports and remittances. Mashreq countries and Pakistan might also be adversely affected through a decline in non-oil exports, official transfers and remittances from the member countries of the Gulf Cooperation Council, especially over the medium term. As Chart 8 shows, the effect is, not surprisingly, negative for oil exporters. Here again, however, there are substantial differences across countries. In all countries, real income goes down, and so do profits in oil production; these are the mirror images of what happens in oil importers. But the degree to which they do, and the effect of the decline in the price of oil on GDP depends very much on their degree of dependence on oil exports, and on what proportion of revenues goes to the state. Oil exports are much more concentrated across countries than oil imports. Put another way, oil exporters depend much more on oil than oil importers. To take some examples, energy accounts for 25 percent of Russia’s GDP, 70 percent of its exports, and 50 percent of federal revenues. In the Middle East, the share of oil in federal government revenue is 22.5 percent of GDP and 63.6 percent of exports for the Gulf Cooperation Council countries. In Africa, oil exports accounts for 40-50 percent of GDP for Gabon, Angola and the Republic of Congo, and 80 percent of GDP for Equatorial Guinea. Oil also accounts for 75 percent of government revenues in Angola, Republic of Congo and Equatorial Guinea. In Latin America, oil contributes respectively about 30 percent and 46.6 percent to public sector revenues, and about 55 percent and 94 percent of exports for Ecuador and Venezuela. This shows the dimension of the challenge facing these countries. In most countries, a mechanical effect of the oil price decline is likely to be a fiscal deficit. One way to illustrate the vulnerabilities of oil-exporting countries is to compute the so-called fiscal break-even prices—that is, the oil prices at which the governments of oil-exporting countries balance their budgets. The breakeven prices vary considerably across countries, but they are often very high. 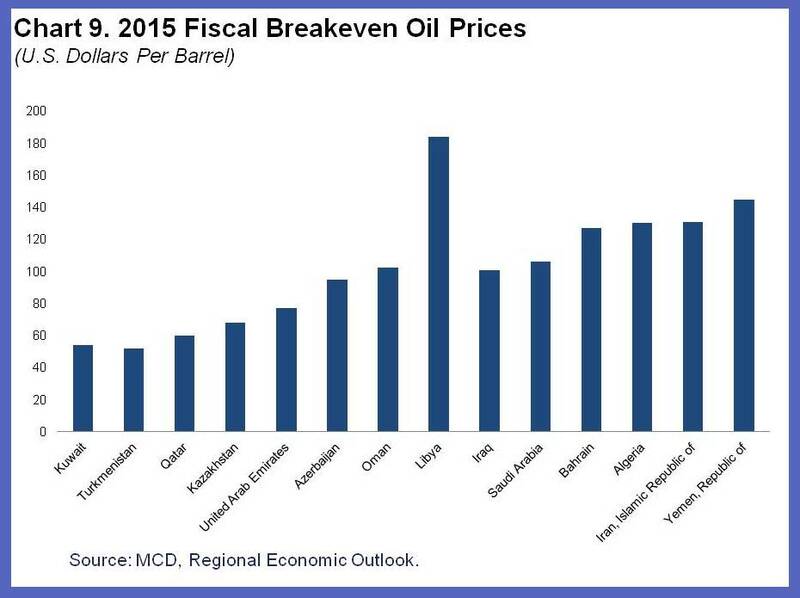 For Middle Eastern and Central Asian countries, the break-even prices range from $54 per barrel for Kuwait to $184 for Libya with a notable $106 for Saudi Arabia (see Chart 9). For countries for which we do not have available data on break-even prices, budgetary oil prices (that is, the oil prices that countries assume in preparing their budget) are another way to gauge countries’ vulnerability to falling oil prices. 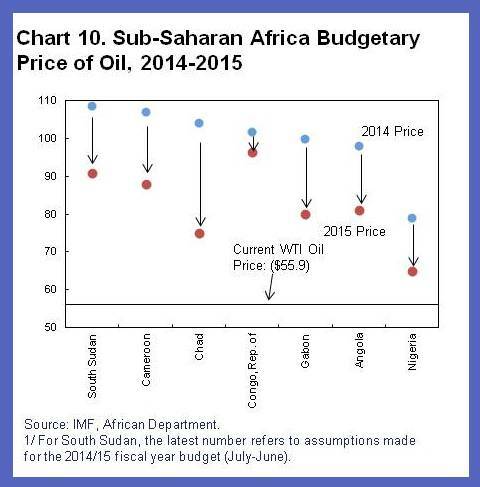 For Africa, those budgetary oil prices have been revised down in 2015 in light of the falling prices (See Chart 10). For Latin America, the budgetary oil prices are $79.7 for Ecuador and $60 for Venezuela. Some countries are better equipped than in previous episodes to manage the adjustment. A few have put in place policy cushions such as fiscal rules and saving funds and have more credible monetary framework, which have helped decouple internal from external balances, such as Norway. But, in many, the adjustment will imply fiscal tightening, lower output, and a depreciation (harder to achieve under the fixed exchange rate regimes that characterize many oil exporters). And where expectations of inflation are not well anchored, the depreciation may lead to higher inflation. Declines in oil prices have financial implications, directly through the effects of oil prices themselves, and indirectly through the induced adjustment of exchange rates. Lower oil prices weaken the financial position of firms in the energy sector, especially those that have borrowed in dollars, and by implication weaken the position of banks and other institutions with substantial claims on the energy sector. The proportion of energy firms with an interest coverage ratio (the ratio of cash flows to interest payments) below 2 stands at 31 percent in emerging countries, indicating that some of these companies may indeed be at risk. CEMBI spreads, which reflect spreads on high yield emerging market corporates, have increased by 100 basis points since June. Stress tests carried out in the context of our financial stability assessments over the past few years in a number of oil exporting countries had found only a few countries where some banks did not pass the tests, implying recapitalization needs of a few points of GDP at most. However, those stress tests results may not be very informative since the capital buffers at the time of the tests may have changed, as well as the profitability of banks. Russia is a good example of rapidly evolving conditions in both respects considering the effect of sanctions on its financial sector. Overall the impact of lower oil prices on banks in oil-exporting countries will depend critically on how persistent the fall in price is and its impact on economic activity and in turn on prevailing buffers. Lower oil prices also typically lead to an appreciation of oil importers’ currencies, in particular the dollar, and to a depreciation of oil exporters’ currencies. The drop in oil price has contributed to an abrupt depreciation of currencies in a number of oil exporting countries including Russia and Nigeria. While the decrease in the price of oil is only one of the reasons behind the fall of the rouble, the Russian currency has depreciated by 40 percent so far this year, and 56 percent since September. While controlled depreciations can help oil exporters adjust, they also exacerbate financial problems for those firms and governments whose debt is denominated in dollars. And, in countries where expectations are not well anchored, uncontrolled depreciations can lead quickly to very high inflation. If sustained, the oil price slump will thus have a concentrated and material impact on those bondholders and banks with high dollar and energy sector exposures. However, the global banking system’s exposure is likely not to be large enough to cause more than a moderate increase in provisioning requirements and should be partially offset by improving credit quality in oil importing countries and sectors. Some oil importers may nevertheless have financial sector linkages to oil exporters, and may be exposed to economic and financial developments in the latter. For example, Austrian banks have significant exposure to Russia, and some have seen a very sharp decline in their equity price recently. This relatively optimistic assessment must however come with a clear warning. One of the lessons from the Great Financial Crisis is that large changes in prices and exchange rates, and the implied increased uncertainty about the position of some firms and some countries can lead to increases in global risk aversion, with major implications for repricing of risk, and for shifts in capital flows. This is all the more true when combined with other developments such as what is happening in Russia. One cannot completely dismiss this tail risk. Clearly, the appropriate policy response to falling oil prices will depend on whether the country is an oil importer or exporter. The exception is the shared opportunity provided by low oil prices to reform energy subsidies and energy taxes. The IMF has long advocated that governments use the saving from the removal of energy subsidies toward more targeted transfers. Low prices provide a great opportunity to remove subsidies at less political cost. For example, India was able to decrease diesel subsidies recently, and there were no protests as the price did not rise. And, in a number of advanced countries, this might be an opportunity to increase energy taxes, using the savings to reduce other taxes, such as labor taxes. Now let’s turn to oil importing countries. In normal times, for a country in good macroeconomic health — say, no output gap, inflation is at target and current account is balanced— the advice is well honed, learned from past movements in oil prices: monetary policy should make sure that, in the face of lower headline inflation, inflation expectations remain anchored, and try to maintain stable core inflation. Whether this implies an increase or a decrease in the interest rate is ambiguous. On the one hand, higher demand calls for higher interest rates; on the other hand, keeping core inflation from declining, may call for lowering interest rates. In general, whatever the interest rate does, the improvement in the current account balance is likely to generate an exchange rate appreciation. This appreciation is natural, and desirable. Times are not normal however. Most large advanced economies suffer from a substantial output gap, inflation below target, and conventional monetary policy constrained by interest rates close to zero. This suggests that any increase in demand is welcome at this stage, and that lower inflation, which cannot be offset by lower interest rates, is more dangerous. Against this backdrop, use of forward guidance to anchor medium run inflation expectations and avoid sustained deflation is crucial. One might think that the appropriate policy response for oil exporters is the same as that of oil importers, but sign reversed. Importers differ however from exporters in two important ways: first, the size of the shock faced by oil exporters as a proportion of their economy is much larger than for oil importers. Second, the contribution of oil revenues to fiscal revenues is typically much higher. Thus, in all countries, lower fiscal revenues, and the risk that prices remain low for some time, imply the need for some decrease in government spending. In countries that have accumulated substantial funds from past higher prices, allowing for larger fiscal deficits and drawing on those funds for some time is appropriate. This is even more so for exporters with fixed exchange rates, and where the real depreciation needed for adjustment may take some time to achieve. For countries without such fiscal space, and where room to increase the fiscal deficit is limited, the adjustment will be tougher. Those countries need a larger real depreciation. And they need a strong monetary framework to avoid that depreciation leads to persistently higher inflation and further depreciation. This will indeed be a challenge for a few oil exporters. Arezki, R. , Loungani P. , van der Ploeg, R. and Venables T. , (2014). Understanding International Commodity Price Fluctuations, Journal of International Money and Finance, Vol 42, April, pp. 1-8. Blanchard, Olivier J. and Jordi Gali, 2009. The Macroeconomic Effects of Oil Price Shocks: Why are the 2000s so different from the 1970s? in J. Gali and M. Gertler (eds. ),International Dimensions of Monetary Policy, University of Chicago Press (Chicago, IL), 373-428. Baumeister Christiane & Gert Peersman, 2013. 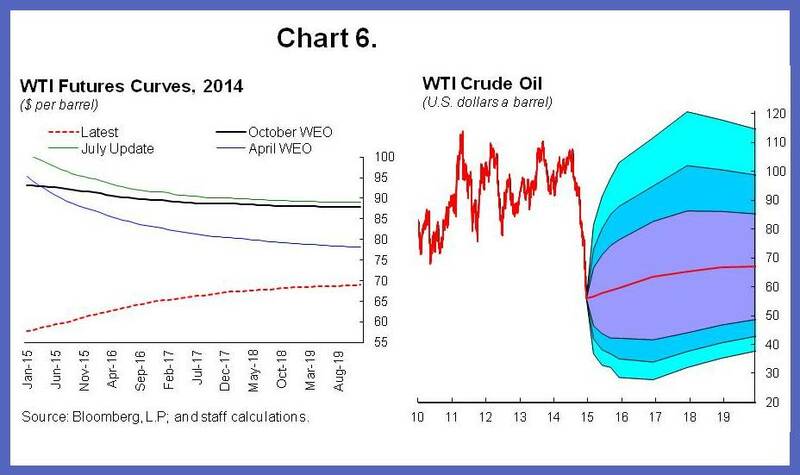 “The Role Of Time‐Varying Price Elasticities In Accounting For Volatility Changes In The Crude Oil Market,”Journal of Applied Econometrics, John Wiley & Sons, Ltd., vol. 28(7), pages 1087-1109, November. Cashin, Paul, Kamiar Mohaddes, Maziar Raissi, and Mehdi Raissi (2014). “The differential effects of oil demand and supply shocks on the global economy”, Energy Economics, Volume 44, July 2014, Pages 113-134. Clements, Benedict, and others, Energy Subsidy Reform: Lessons and Implications(Washington: International Monetary Fund). Hamilton, James D., 2003. “What is an oil shock?,” Journal of Econometrics, Elsevier, vol. 113(2), pages 363-398, April. Kilian, Lutz, 2009. “Not All Oil Price Shocks Are Alike: Disentangling Demand and Supply Shocks in the Crude Oil Market,”American Economic Review, American Economic Association, vol. 99(3), pages 1053-69, June. Parry, Ian, and others, 2014, Getting Energy Prices Right: From Principle to Practice(Washington: International Monetary Fund). Peersman, Gert & Van Robays, Ine, 2012. “Cross-country differences in the effects of oil shocks,”Energy Economics, Elsevier, vol. 34(5), pages 1532-1547. We are grateful to numerous colleagues in particular Thomas Helbling, Ben Hunt, Douglas Laxton, Prakash Loungani, Akito Matsumoto, Gian Maria Milesi Ferretti, as well as colleagues in the modeling and commodities teams and in the African, Asia Pacific, Europe, Fiscal Affairs, Middle East and Central Asia, Monetary and Capital Markets, Strategy and Policy Review and Western Hemisphere departments. We also thank Rystad Energy and Per Magnus Nysveen in particular for kindly providing proprietary data on capital expenditures and cost structures. These price changes are based on the IMF average petroleum spot price (APSP), a simple average of U.K. Brent, Dubai, and West Texas Intermediate. Gains from Libyan production in September have however reversed in November according to the latest report from the International Energy Agency. See Arezki, Loungani, van der Ploeg and Venables (2014) and references therein for a discussion on the respective role of fundamentals and financialization in driving commodity price fluctuations. The supply component in the second scenario is 60 percent in 2014, 45 percent in 2015, 30 percent in 2016, 20 percent in 2017, 10 percent in 2018 and zero in 2019. In their recent assessments of the effects of the oil price decline, the Bundesbank estimates that a price decline of $10 lead to 0.2 percent increase in GDP in year 1, and the French authorities’ estimate that the same price decline would raise GDP by 0.1 percent after two years. In the academic literature, Hamilton (2003) and Kilian (2009) provide empirical investigations of the relationship between oil price and the macroeconomy including a discussion on the identification of supply vs. demand shocks. Baumeister and Peersman (2012) and Peersman & Van Robays (2012) and Cashin et al. (2013) provide cross-country and time varying estimates of the effect of oil prices on output. The oil cost share is computed as the ratio between oil consumption and GDP average over the period 2004-2014. The data sources are BP Statistical Review (2014) and staff own calculations. For Venezuela, the latest available estimate of the share of oil in public sector is for 2013 and is the share to central government revenue. The calculations of the fiscal break-even prices ignore the offsetting effects of depreciations. In general, an exchange rate depreciation would help partly offset the effect of falling oil prices on oil export receipts in local currency. See Clements and others (2013) on energy subsidy reforms. See also Parry and others (2014) finding that for many countries energy prices are below the level that fully reflect the negative externalities from energy consumption. Author: Rabah Arezki heads the commodities team in the IMF’s Research Department.Olivier Blanchard is currently on leave from MIT, as Economic Counsellor and Director of the Research Department of the International Monetary Fund. Image: A worker fills the tank of a car at a petrol station in Cairo, March 12, 2013. REUTERS/Mohamed Abd El Ghany.